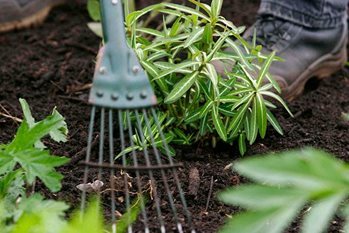 Few garden plants will survive waterlogging or flooding. Prolonged periods of sitting in ground saturated with water causes yellow leaves, root rot and death. However, conditions can be improved using various techniques to promote drainage and prevent damage. Soils become waterlogged when water builds up, unable to drain away. This leaves no air spaces in the saturated soil, and plant roots literally drown. Short-lived flash floods after a downpour seldom harm most plants. It is prolonged, saturated soil that cause the most damage. Some of the symptoms are easily confused with water stress (too little water). But in fact, a waterlogged plant actually is water stressed. This is because the roots are drowning and can not absorb any water or nutrients to move around the plant.